If you have ever wanted to emulate Star Trek and talk to colleagues via a lapel communicator, then now is your chance. The Vocera communications system channels voice calls via a wi-fi network to recognise who someone is trying to reach and then to connect them. Servers do the job of decoding speech to recognise names, find out if the person is available and then a portion of the wireless network is reserved so the people can speak to each other. "It's pretty futuristic," said Keerti Melkote, co-founder of Aruba Networks that is a partner of Vocera. "It's very neat, smaller than a cell phone and very lightweight," he told BBC News Online. Although the voice recognition system needs a bit of training to match names with the way people pronounce them, the system can be working well within a few days, said Mr Melkote. 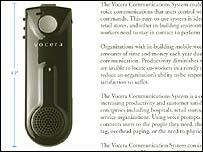 Early customers for the Vocera communicator were hospitals who like the fact that it lets nurses talk directly to doctors. 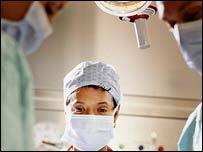 "We're focussing on healthcare to help provide bedside patient care and replace pager type calls," he said. He said pagers can just lead to people leaving endless numbers of messages for each other but never actually speaking. Mr Melkote said the communicator was ideal for workplaces where staff move around a lot, are spread around large campuses or across several buildings. The battery-powered gadget can either be clipped to a lapel or worn on a lanyard around the neck. Can the net take the strain?